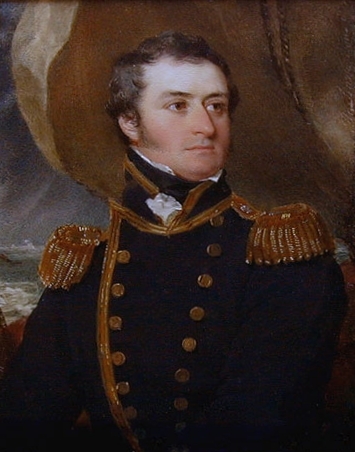 Lieutenant Pascoe reported back on 3 February that he had sighted a force consisting of three ships. Two were the French frigates Aréthuse and Rubis. The third ship was a Portuguese prize, La Serra, which they were unloading before sailing to intercept British merchant vessels, a convoy from England being expected daily. The master and the rest of the crew from Daring arrived in a cartel, having given their parole, and confirmed Lieutenant Pascoe's report. 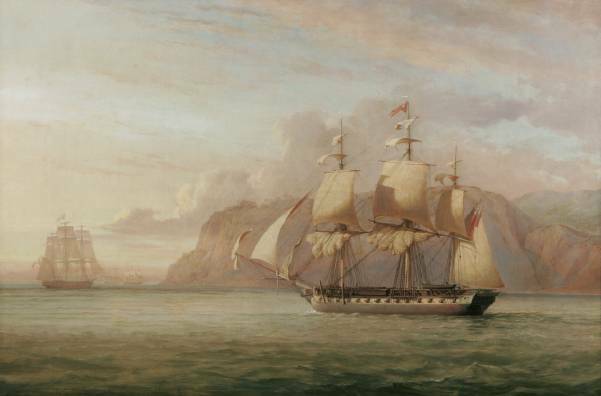 Standing in towards Tamara on 6 February, Captain Irby met the government schooner Princess Charlote and learned that the two frigates were anchored a considerable distance apart. Although he was not aware of it, Rubis, the southernmost one, had struck a rock, which had disabled her. The Aréthuse weighed and stood out to sea followed by Amelia, Captain Irby having hopes of enticing her into action. For nearly four hours they exchanged fire, throughout which Aréthuse used the usual French practice of firing high. Having cut Amelia's sails and running and standing rigging to pieces, the French ship bore up. Twice during the action the enemy had attempted to board but the marines, under the command of Lieutenant Simpson of the Royal Marines, drove them back. John Christian Schetky, "HMS Amelia Chasing the French Frigate Aréthuse 1813"
Herewith I transmit a list of the killed and wounded, and I have the honour to be, &c.
List of Killed and Wounded on board His Majesty's Ship Amelia, Commodore the Honourable Frederick Paul Irby, on the 7th day of February 1813. William R. Pascoe, ditto, late commander of the Daring gun-vessel. John Bogue, late purser of the Thais. John Brown (3), ordinary seaman. William Hammond, supernumerary boy (3rd class). George Brown, deserter from the Fisgard. William Scott, captain of the forecastle, late of the Daring. Anthony Newstub, supernumerary boy (3rd class), ditto. R. G. Grainger, second lietenant of the marines. Thomas Smith, serjeant of marines. William Marshall, ditto, late of the Daring. Peter Bartlett, ditto, late of the Daring. Robert Francis, serjeant of marines. 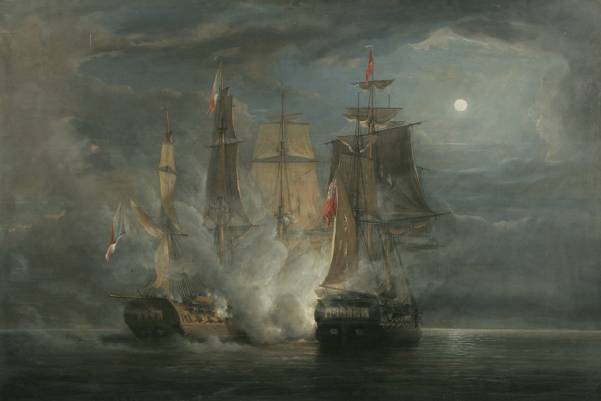 "HMS Amelia in action with the French Frigate Aréthuse, 1813"
Edward Cole, captain of the after guard. John Hill (2), able seaman. William Francis, Serjeant of marines. Honourable F. P. Irby, captain. Richard Poole, eaptain of the forecastle. Benjamin Daniel Smith, able seaman. James Cribbs, supernumerary boy (2nd class). John McLeary, gunner's-mate, late of the Daring. Edward Roberts, able seaman, ditto. William Rambridge, corporal of marines, late of the Daring. William Higgetts, private marine, ditto. William Reeve, lieutenant, late of the Kangaroo. John Brown (5), sail-maker's mate. John Brown (2), ordinary seaman. Henry Piper, ordinary seaman, late of the Daring. William Higgins, ditto, 3d class, ditto. (Signed) FRED. PAUL IRBY, Captain. taken from "Bulletins of the campaign [compiled from the London gazette]." pgs. 148-149. You may be interested to learn that one of the Marines listed as 'Dangerously Wounded' - Daniel Goodall - did survive, although with the loss of his left leg below the knee. He claimed a pension from the Royal Hospital, Greenwich, and died in 1857, in Edinburgh. He had originally joined the Royal Navy as a sailor, served aboard HMS Temeraire (and was aboard her during the mutiny of 1801), was paid off, and enlisted into the Royal Marines in 1803. He was discharged on the 1st November 1813, and his memoir, Salt Water Sketches: Incidents in the Life of Daniel Goodall, is available as a downloadable PDF from Google books or, alternatively, as a print-on-demand book from Amazon. This is really interesting... thanks for sharing the extra info with us! I must say, I do like all the information that you have here, and if I wasn't on the wrong side of the Atlantic (and a woman!) I would love to join your crew as a Marine. I have taken the King's Shilling as a member of the 50th Foot, however, so it's not all bad.